In May we welcomed onboard a new member of staff to our gardens estate team, Fraser Deans. Over the coming season I am sure you will encounter Fraser during your visit going about his many duties within the gardens and surrounding woodland. If you are curious about nature, conservation and wood craft then Fraser is your man. I was born in Germany on a British Military base due to my father being in the military. I have moved around a lot through my childhood finally settling in Guernsey Channel islands in 2001. Once I had completed my school education and further education, I then trained as a butcher and worked as one for one and a half years. I realised that my passion lay in the outdoors, so I went back to education and attended Sparsholt College Hampshire, where I achieved the highest marks in Game and Wildlife management. I am still at Sparsholt now completing a BSC (HONS) in Conservation and Wildlife Management. 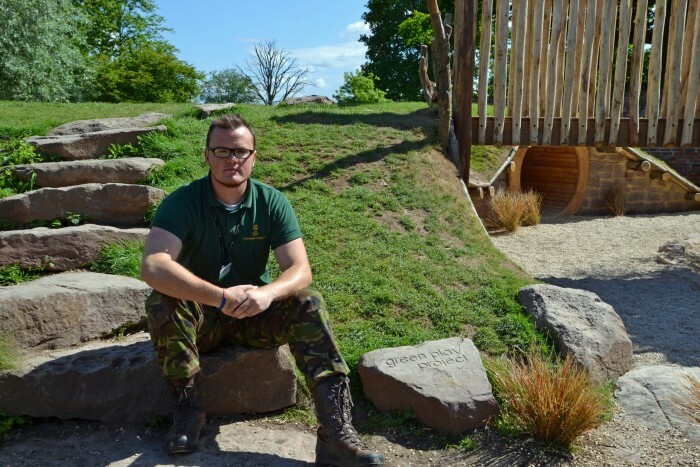 Fraser Deans – Outdoors engagement officer. 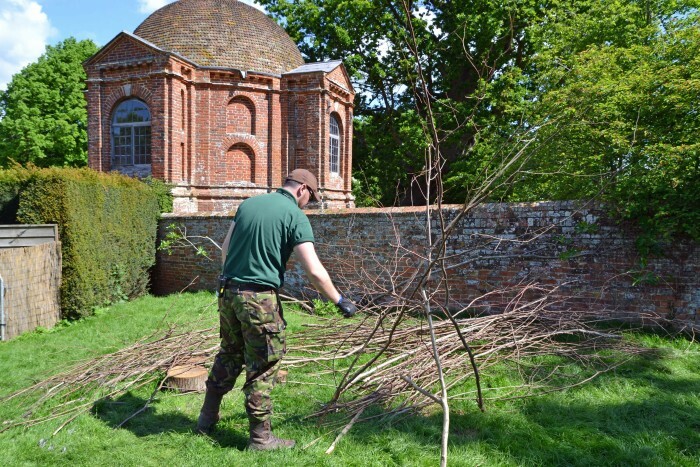 I started volunteering at The Vyne in 2011 as a Ranger. I was then employed as a seasonal ranger here to cover the time between new roles being advertised and then recently applied for the Outdoor Engagement Officer job. I was interested and keen to enable people to get outdoors,appreciate nature and enjoy the beauty that I take for granted working in stunning locations. I am really into woodland skills, coppicing, carving, charcoal making, weaving or generally having a good time in the woods. Conservation is close to my heart as I have seen things change irrevocably even in my short time on the planet, so I feel that I need to help preserve what precious environments that we have left. My central role here at the Vyne is visitor engagement based, so I will be running events in the outdoors, working closely with the outdoors teams, managing volunteer groups and getting stuck in where I am needed in and around the estate. Fraser working on preparations for the new den in the ‘Hidden Realm’. 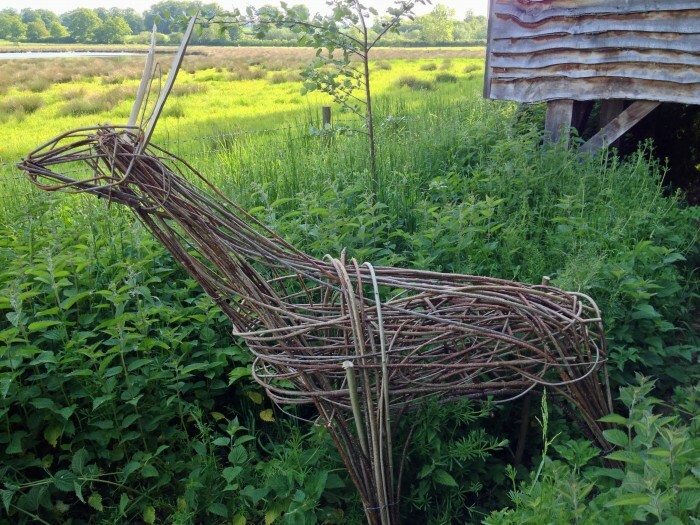 A trip to our wetlands nature reserve will reward you with some of Fraser’s recent handiwork, wildlife woven in hazel. Here a stag stands proudly looking out onto the open pastures beyond. If you are keen eyed you may discover another sculpture created by Luke Clark our new (Woodland ranger) somewhere in the grounds. This creature is a bit flighty though so you’ll need a keen eye to spot him! Stag sculpture located in the wetlands reserve courtesy of Fraser’s craftwork.